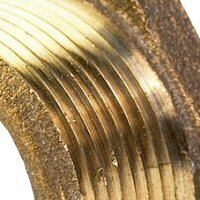 1/4" x 1/4" Hi-Flow 90° male elbow brass air brake fittings are used in conjuction wth reinforced nylon air brake tubing NT100 - SAE J844 Type A and B. Pressure and vibration: maximum operating pressure of 150 psi and fair resistance to vibration. Other applications include lubrication and air controls. The minimum burst pressure of airbrake tubing is 1,200 psi. Conformance: Meets SAE 100102ba and DOT FMVSS 571.106 specifications.